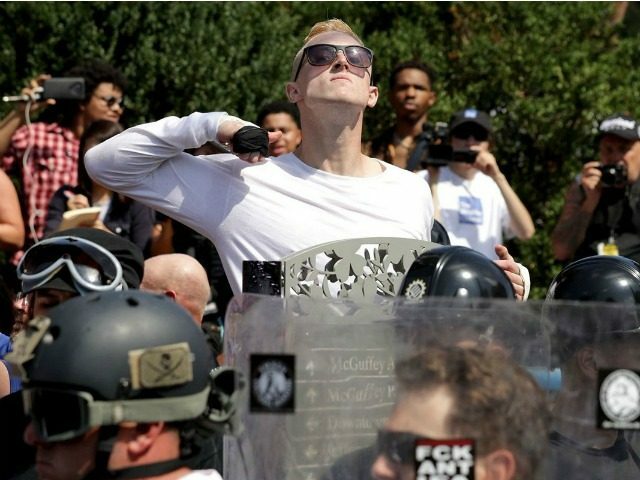 A bizarre report on dictator Nicolás Maduro’s public appearances on Venezuela’s state-run media outlet Tuesday appeared to refer to violent rallies in Charlottesville, Virginia, this weekend as being located in “Chicago” and quotes Maduro claiming that Venezuelan opposition groups have used the same insignia as the Ku Klux Klan (KKK) at anti-socialist protests. The geographical error on the site is particularly embarrassing for the Venezuelan government given remarks by Nicolás Maduro, Jr., a 27-year-old appointed to the fraudulent alternative legislature his father created to drown out the voice of the opposition, threatening an invasion of the White House. “If the United States wants to stain our fatherland soil, the firearms will reach New York and we will take the White House,” the younger Maduro stated, leaving many questioning whether he was aware that he would not find the White House in New York. The VTV story in question refers to what has become a daily tirade against the United States from Maduro, this time on Monday when he condemned the KKK and claimed they had some association with anti-socialist peaceful protesters in Venezuela. Speaking at a podium decorated with late dictator Hugo Chávez’s face and the Twitter hashtag “#TrumpOutofLatinAmerica,” Maduro claimed that those marching in Charlottesville “use similar shields” as Venezuelan opposition protesters. 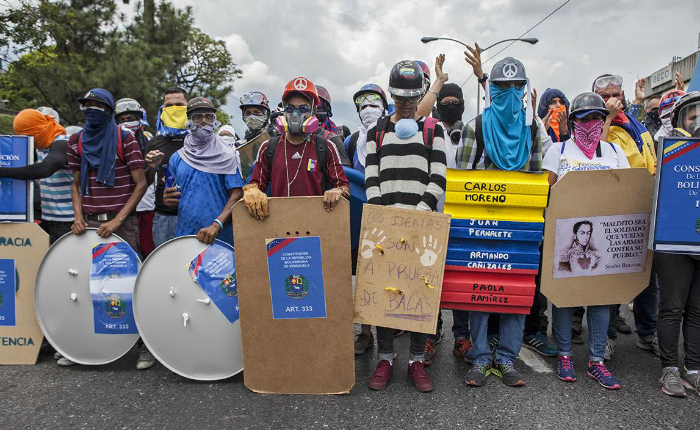 The pervasive use of state violence against protesters—largely the use of tear gas, rubber bullets, and armed vehicles—have led Venezuelan protesters to protect themselves with shields made of cardboard or what appear to be scraps from trash cans. The protesters have decorated many of these shields with the Venezuelan flag, quotes by founding father Simón Bolívar, and the names of the over 100 killed by state violence since March. 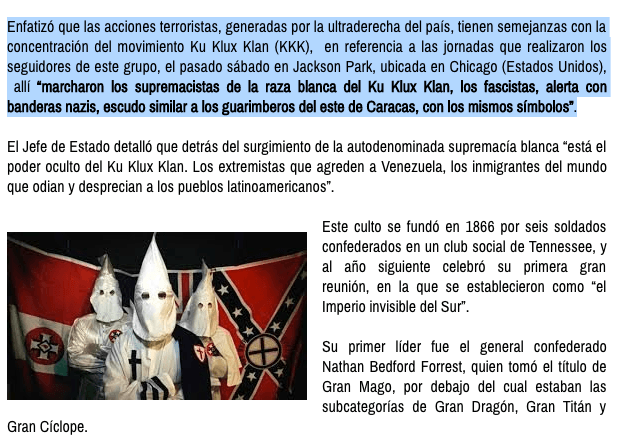 Maduro did not explain the correlation between the KKK and the protesters’ shields. Given both the violence against peaceful protesters from the military and Maduro-approved chavista gangs known as colectivos, the American embassy in Caracas has warned Americans in the country that they may be the target of hate violence. “We call on American citizens to avoid transiting through protests; even those that have appeared peaceful can generate confrontations and escalate into violence,” a statement from the embassy this week read. The Venezuelan site Runrunes, which has monitored government-related homicides since daily protests began in late March, has documented 151 deaths in Caracas alone this May. Between April and August 2017, Runrunes documented 121 protest-related homicides nationwide.